Drones: Eyes in the Sky, or Hurdles to Cross? Frequently making headlines today is the use of “drones,” or unmanned aerial vehicles (UAVs), particularly as it relates to package delivery. But drones are become widely used in a variety of professions. Take cinema and television, for instance. “The last two Bond films, Skyfall and Spectre, used drones to do some of their filming,” she said. Drones are being used in a variety of agricultural applications, from analyzing fields to planting seeds and spraying crops. Emergency response teams, for whom time is the critical element, are also benefiting from the use of drones. “You could send a group of drones to an impacted area to address the most pressing needs,” Sheridan pointed out. But drones are not particularly expensive, Sheridan noted in concluding the session. 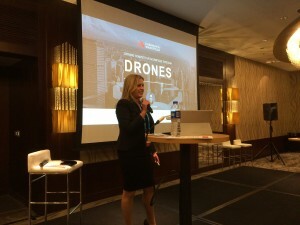 “Lower-end commercial drones are about US$1,000,” she said.